The use of SSL on your website will provide additional security for transactions going through your website. If you have paid subscriptions on your website, the SSL is a must and it will also make your website look more professional in front of your users. The configuration of SSL on SocialEngine is easy. The script will generally work with both the http and the https protocol, if you have an SSL installed on your domain. However, you can force the use of SSL on your website as well. The first step is to get a valid SSL certificate for your domain. This is a paid service and if you do not have such an SSL certificate, you can purchase it via your Client Area. To force the use of SSL on your website, you need to edit the .htaccess file of your website. 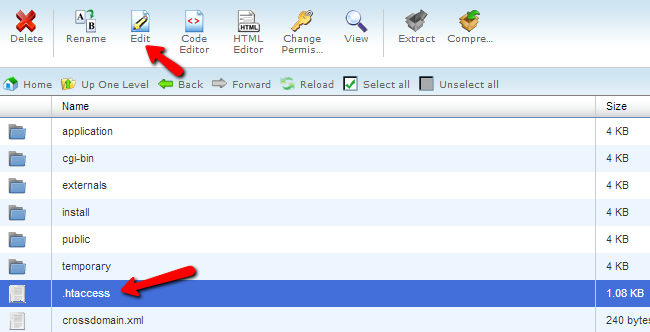 For that purpose, you can access your cPanel account, locate the Files tab and then click on the File Manager service. Select the Home Directory and Show Hidden Files (dotfiles) options and then click Go. Navigate to the location, where your SocialEngine script is installed. This is usually within the public_html/ directory of your account, but be careful if your website is installed on subdomain or a subfolder. Once you access your SocialEngine installation, locate the .htaccess file, select it and then click on the Edit button at the top. Where example.com is the domain you are using on your website. Confirm the change by clicking on the Save Changes button at the top-right corner of the screen.